Description of "How To Make Delicious Biscotti - Recipes Included (eBook)"
In this book I will show you how to make delicious biscotti. Instructions and different recipes are included in the book. Meallá cooks, bakes, tests and writes recipes books. 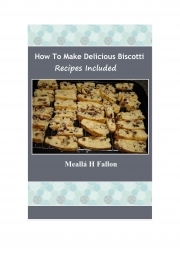 Reviews of "How To Make Delicious Biscotti - Recipes Included (eBook)"